Congratulations KPMG teams in Sydney, engaging with Thrill events specialists taking purpose to lead with passion to deliver. Wow what a year its been. As managing director of a team building company we are often at the face of the organisation. Facilitating events, delivering team building programs, creating new ideas for team development. It’s been a wonderful journey. I have met some truly inspiring people. Some I can trust and others they fall away to the side as each of us has other priorities. So what makes team building stick? That is, what makes the grey fuzzy area between people remain connected and generate results that you can rely upon. Who has got your back in your organisation. Are the decisions and staff you are employing the best at what they claim to do? Honestly. Thrill has that purpose to lead with passion and deliver brilliantly. Time and time again. Consistently generating energy to fire up the next team, company and organisation. To this end. I witnessed KPMG’s finest staff collaborate and embrace the team development activities we presented. From caricatures on the streets of Kings Cross to getting on target with a series of relay games in Rushcutters Bay. The employees embraced concepts and elicited strong results. Konrad Lippmann – Team Building Ideas developer and facilitator; 25 years industry experience. You are technically savvy and on the way to your next Amazing Race location checkpoint. Theme: “It Takes purpose to lead and passion to deliver”. Scored out of 100 points! Complete the en-route TASK as you register at exercise location (far below) within a maximum of 15 Minutes. Sharing an or performing an Amazing True Story – get your team to act the parts. Or your people demonstrating ‘Leading and Passion’ within KPMG business values. Ensure it makes a statement about your, your business and YOUR TEAM ! Be sensible as well as Clever and Creative for maximum Points/100 !!!! Complete this Task before registering for up to 100 Bonus Points. Also The more likes – The more Points. N.B. If there is a company policy that contravenes utilising Facebook in this manner. Then show your Video to Thrill staff at the next check point. Do not be LATE 15 minutes including travel time. Penalty -20pts / minute. 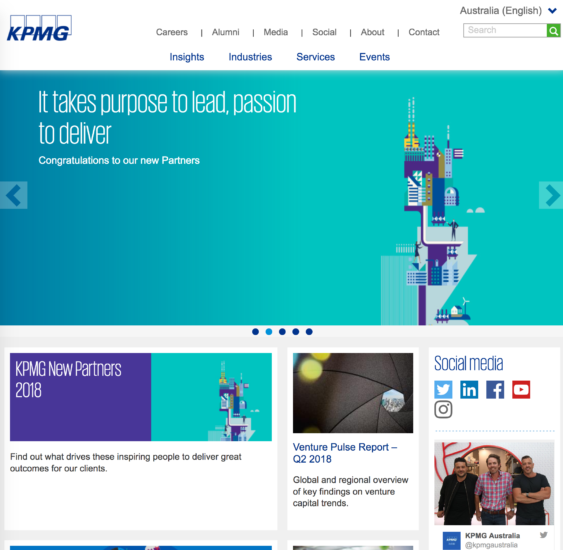 KPMG is a professional service company and one of the Big Four auditors, along with Deloitte, Ernst & Young, and PricewaterhouseCoopers.